The Veuve Clicquot vineyards in France’s Champagne region enjoy an enviable location, bathed in both maritime and continental climates. The diversity of the subsoil and terrain are make for a wide variety of “crus”, or growing areas. Over 90% of Veuve Clicquot’s total vineyards area (393 hectares) enjoys the prestigious Grand Cru and Premier Cru classifications. A huge amount of meticulous care and attention is devoted to tending Veuve Clicquot vines. The champagne house is actively committed to protecting the environment and the health and safety of its winegrowers, practicing sustainable viticulture. A single hectare of vines requires between 380 and 420 hours of work per year, including working the soil, pruning, binding, and disease control. 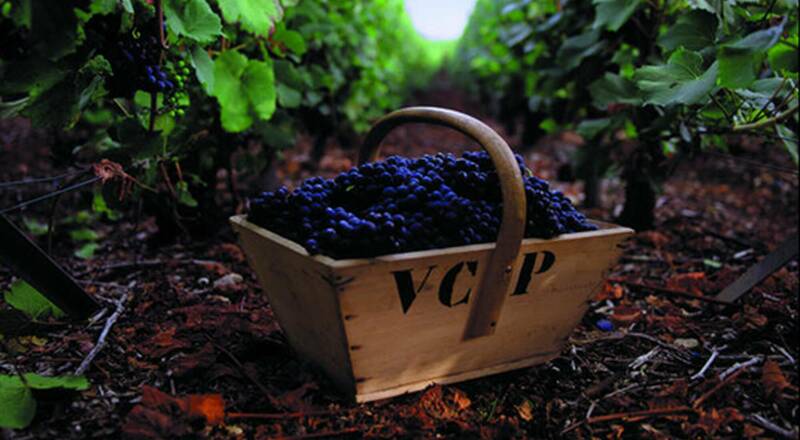 The grapes must be harvested when they are perfectly ripe, when the balance between sugar and acidity is just right. Using manual harvesting techniques, it takes a team of 45 people to pick the ripe grapes from each hectare of vines. The precious fruit is taken to presses, where it is crushed to create a liquid known as must. Veuve Clicquot is able to cover 40% of its grape supply requirements, and has six press houses. Veuve Clicquot places considerable importance on the concept of “origin”, i.e., precisely where the grapes come from. Even before the blending process starts, vinification is carried out separately for each grape variety, each vineyard plot, and each “cru”, thus maximizing the range of possibilities available to the winemakers. A full 24 hours after pressing, natural yeasts are added to the must to start the first fermentation process. It is only after 8 to 10 days that the sugars are converted into alcohol, and “still wine” is obtained. Blending can then begin. Veuve Clicquot’s team of expert winemakers, led by Chef de Caves Dominique Demarville, meets in late December/early January to taste the year’s wines. Each wine is assigned to that year’s cuvée, or blend, or to the “reserve” or “vintage” categories, if a vintage is declared. Wines that do not meet the champagne house’s strict quality requirements are not used. Non-vintage (NV) champagne is a sophisticated blend of wines from the year’s harvest with reserve wines. Veuve Clicquot’s flagship NV blend, Brut Carte Jaune (Brut Yellow Label in English), is produced from around sixty different crus (Grands Crus, Premiers Crus and others), and blended with between 25 and 40% vintage wines. It is this subtle alchemy that gives Veuve Clicquot champagne its distinctive personality, and guarantees its excellence. After blending, the still wine is bottled, and the bottles are sealed with a temporary cap. The second fermentation converts all of the sugar into alcohol. The magic of the champagne method lies in this natural yeast-driven chemical reaction, which produces the carbon dioxide that gives the wine its bubbling effervescence. The precious nectar is then left to mature in the firm’s ancient chalk cellars in the city of Reims, which provide ideal conditions for ageing thanks to high levels of humidity and a constant temperature of 10-12°C. Ageing is followed by a process known as “riddling” (remuage in French), which involves turning and tilting the bottles on a daily basis, so that the lees (sediment) collect in the neck, making them easier to extract. The sediment is removed (or “disgorged”) by freezing the neck of the bottle in a saline solution at minus 26°C, and extracting the plug of ice containing the lees, while at the same time removing the temporary cap. Before final corking, Veuve Clicquot tops up the liquid level in the bottles with a mixture of reserve wine and sugar, in a process known as “dosage”, which ultimately determines the sweetness of the champagne (brut, sec, demi-sec, etc.). After resting for a further few months to allow the flavors to fuse to perfection, the bottles are checked to ensure that the wine is absolutely clear. They are then ready to receive the stylish and distinctive foil capsule, label, neck label and back label which ensure that the packaging of Veuve Clicquot is itself worthy of the remarkable quality of the champagne in each bottle.